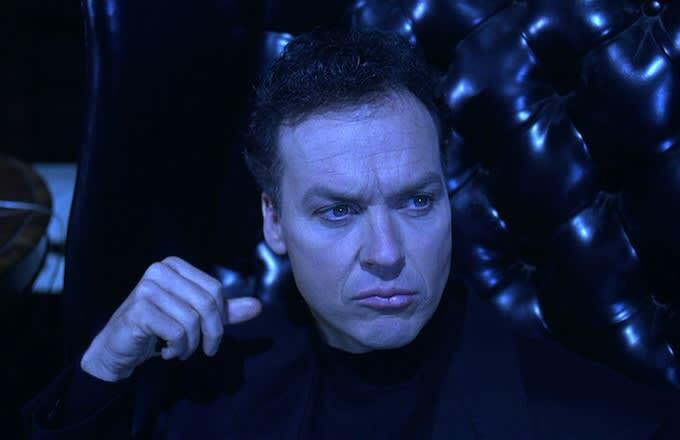 Michael Keaton is getting asked about his Batman role, again. The recent Golden Globe (and likely Academy Award) nominated actor&apos;s comeback role is Birdman. As Riggan Thomson, Keaton was pitted against a costumed foe from his past. That foe was Riggan&apos;s previous stardom as Birdman, a superhero that was a big deal before superhero movies became such a big deal. But while Riggan Thomson might not stand up for Birdman, if someone asked for the real Batman to stand up, Keaton would. Keaton played Batman twice. Then when Warner Brothers balked at how dark Tim Burton&apos;s Gotham was becoming, they bailed, as a duo. Keaton left a hefty paycheck on the table ($15 million). But he doesn&apos;t regret that. Mostly because he thought Batman Forever "sucked." “I hadn’t been stupid about it. I always knew it was a big machine with a big studio and corporation behind it. But the simple answer was, [Batman Forever] wasn’t any good. I was nice. I said to them, ‘This is a really interesting character with a dual personality.’ I tried to make them understand. But when somebody says to you, ‘Does it have to be so dark?‘ I thought, are we talking about the same character? So finally I just said no.” Keaton said. Christian Bale admitted that he was "jealous" of Ben Affleck being asked to don the bat-suit for Zack Snyder&apos;s Batman v. Superman. And when he heard of the Bat-fleck casting news? Bale estimated that, in a moment of weakness, he "stared into nothing for half an hour". So, Variety posed the question to Keaton. Are you jealous of the subsequent Bat-men? There you have it. Michael Keaton isn&apos;t jealous of Val Kilmer, George Clooney, Christian Bale or Ben Affleck. He and Burton sent out the invitations, and the rest just joined them at their Bat Cave party, for their host&apos;s amusement. Will the Real "Birdman" Please Stand Up? Ben Affleck Will Be a "Tired" Batman, Says Warner Bros.